One of the best things about the [easyazon_link identifier=”B00ZVJAF9G” locale=”US” tag=”arizonacaorg-20″]Amazon Fire TV Stick[/easyazon_link] is that it’s capable of allowing the user to Enable ADB Debugging. To Enable ADB Debugging is to make use of a system by which [easyazon_link identifier=”B018IZ0SWI” locale=”US” tag=”arizonacaorg-20″]Android[/easyazon_link] developers can test the apps they make for the Google Play Store (and even some that aren’t in the Google Play Store). Without ADB Debugging, Android developers wouldn’t be able to deliver the high quality apps with the speed and great end-user experience they currently do. 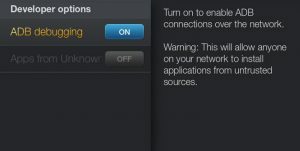 Go to the System (or “Settings”) area in the Android device. Editor’s Tip: You most likely also want to enable Apps From Unknown Sources. This will – you guessed it – allow you to install apps from unknown sources. To be clear, “apps from unknown sources” means “apps that aren’t ‘official’ and in the Google Play Store. What Does Enable ADB Debugging Allow Me to Do? What Does Apps from Unknown Sources Allow Me to Do? Apps from Unknown Sources will allow you to install unsigned Android apps to your Android device / FireTV. Basically, the apps most people use are “signed” apps that are “official” and are registered in the Google Play Store (for iOS apps, it’s the same way but with the Apple iTunes store instead). Apps must meet a certain list of criteria to be part of the Google Play store. So, by using Apps from Unknown Sources we give ourselves access to a much larger list of Android apps from which we may choose to install. What Are the Best Apps from Unknown Sources? Here’s a short list of the Top 5 Apps from Unknown Sources for Android. Yes, you can install any or all of these apps from unknown sources onto any Android device. We did note the one exception below in red. Firefox: The world’s most favorite fox-faced web browser is available to use on Firestick! You may want to use a Bluetooth mouse and/or keyboard when using Firefox for Fire TV, or a “mouse app” for your phone. IPVanish: This nifty little app re-routes your streaming traffic through any of hundreds of secure servers from around the world to unblock streams. FireStick Note: This Android app works for all Android devices except Firestick, since Firestick has no built-in VPN capability). Mupen64plus AE: Mupen64plus AE (“Android Edition”) is an Android port of the popular Nintendo 64 emulator available for several operating systems. 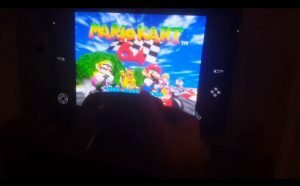 The Android Edition of Mupen 64 plus works great – we tested Mario Kart 64 with it and it passed with 250cc’s of nitro power & N64 racing goodness. We highly recommend using an OUYA Bluetooth gamepad or other Bluetooth controller for playing emulators on Firestick / FireTV. SNES9x: This amazing Super Nintendo emulator rocks the house with solid dependability and an easy, intuitive interface. PLUS it played every single game we threw at it without any issues at all. We tested at least some of the best SNES ROMs out there, including Final Fantasy 3, Pilot Wings and Super Mario Kart. Yes – it was just like “back in the day”. If you want to get fancy, use ES File Explorer to access your Dropbox from your FireTV and play any ROMs (Noobs: ROMs are game files) you store in your Dropbox. I’ve scanned all of these and nowhere do I find DEVELOPER OPTIONS or anything about ADB Debugging. Very glad to hear it! Things have changed a bit since this was written. I’ll be posting an updated article soon, so be on the lookout. There are many great changes coming.